Recent changes in climate are impacting a variety of species worldwide, and penguins are certainly not immune. King penguins in particular are extremely sensitive to these changes in their environment. The King penguin is considered a flagship species for climate change. With many of their major colonies declining in numbers in recent years, scientists have turned their attention to the causes and consequences of climate change on this species, and the potential actions that could save it from extinction. The King penguin is an apex predator living in the sub-Antarctic region. King penguins exclusively breed in year-round ice-free islands scattered throughout the Southern Ocean. To eat, they follow fish stocks around the Antarctic Polar Front, a boundary between colder, saltier water closer to Antarctica and the warmer less salty water of the South Atlantic Ocean. King penguins are central place foragers which means that they travel from their nesting sites to a distant foraging location, rather than just passing through an area exploring or traveling at random. Thus, King penguins have foraging and breeding grounds distributed in a fragmented landscape. A recent study1 that monitored the current and ancient conditions of penguin distribution and prey availability has found that the foraging range of King penguins is displacing southwardly, possibly in response to warming waters. As a result, penguins will have to travel farther to find their prey. This implies that for many populations located in islands in which the foraging range is shifting, there will be decreasing numbers in the future. For example, the Crozet population, one of the largest colonies of King penguins, is already showing declines since the past decade. When environmental factors change suddenly, species can adjust to these changes using behavioral plasticity (i.e. changing behaviors) or by rapidly evolving. For example, penguins could change behavior and colonize new islands (i.e. disperse) and/or could start traveling farther distances. However, scientists have found that penguins traveling further are putting their energetic balance at risk, eventually having lower reproductive success. If that balance is altered in several hundreds of individuals at a colony, it will be disastrous. 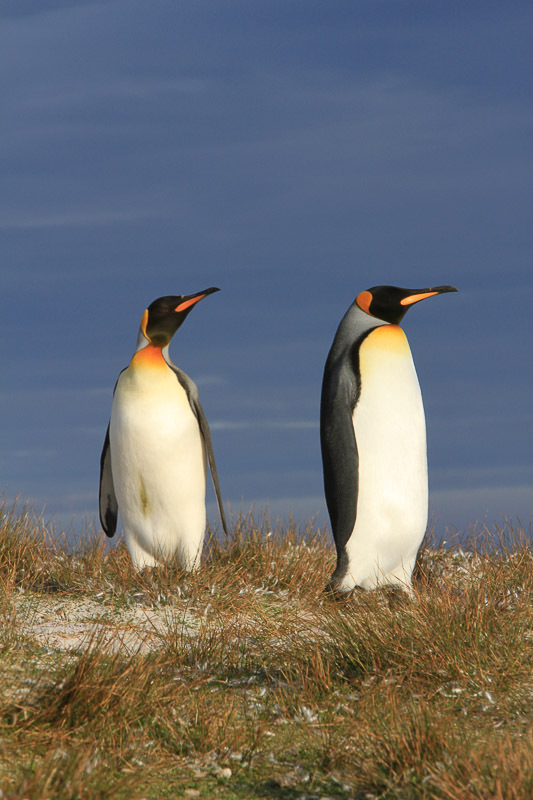 In order to predict what will happen with King penguins in the upcoming decades, scientists had to first reconstruct a palaeohabitat of the species’ demography, based on old climatic records and genome information. This allowed them to understand the primary causes of population changes. They found out that massive changes in the ocean’s primary productivity caused large population changes in the past for penguins. 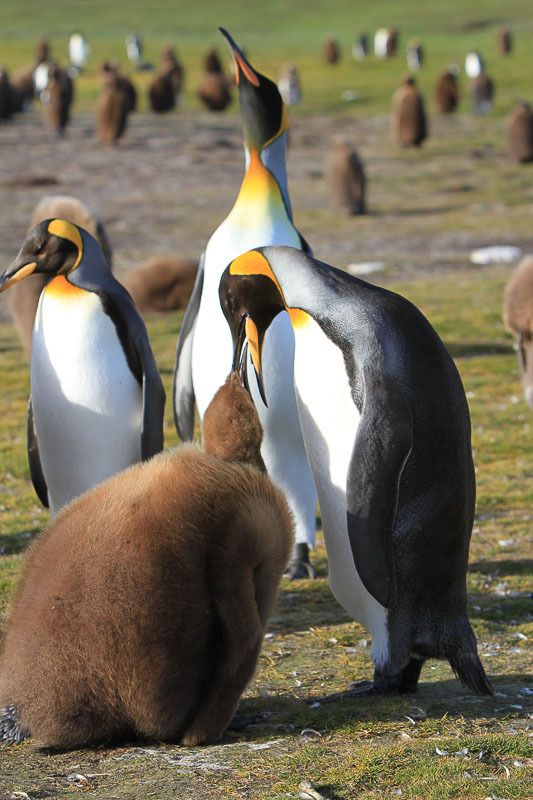 Therefore, prey availability would be the most important limiting factor for the King penguin’s distribution in the future. If the worst scenario of climate change occurs, many big colonies will witness dramatic declines in numbers, because the distance to their foraging grounds will increase considerably. Most of the colonies negatively impacted are located in the northern range of the species’ distribution. The colonies at the South of the Antarctic Front will probably be the best refugia for King penguins, places such as South Georgia Island. Potentially, there will also be new colonies that could be recolonized. The low genetic diversity of this species as well as the long time to mature and produce offspring will most likely not allow rapid adaptive evolution in this species. 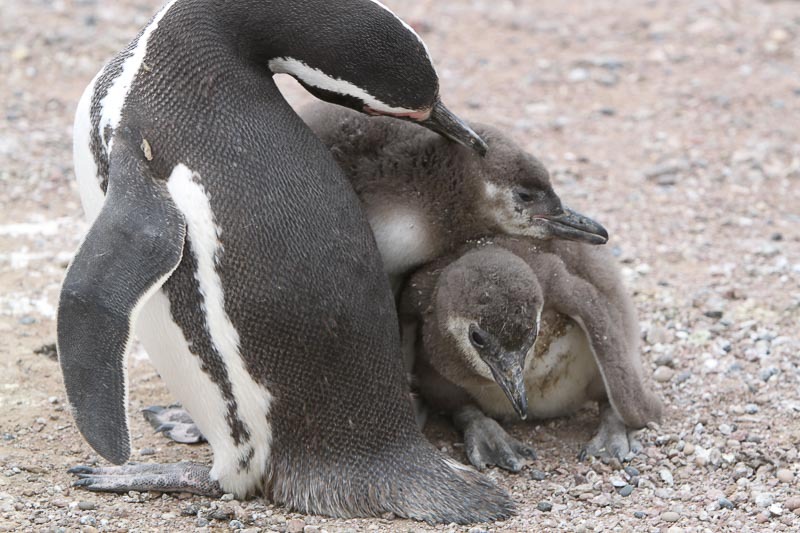 Changes in foraging conditions would be required for penguins to survive. Eventually, the outcome for many individuals could be local extinction or dispersal to new islands (if available). The predictions that scientists made for total numbers are dramatic. In the worst scenario, up to 70% of the present breeding pairs of King penguins could disappear. Moreover, almost 50% of the current world population could lose their habitat, especially those located in the largest and northernmost colonies. Such predictions do not even take into account possible simultaneous changes that could impact penguin prey. In summary, recent data is providing more and more evidence of our negative impact in the natural world due to climate change. Many species will lose their habitat due to range shifts everywhere, not only King penguins. It is our responsibility as human beings to work together in this climate crisis and not let our planet drift toward the worst scenario in the upcoming decades. King penguins will be really thankful. Did you know this about King penguins? What do you think and/or what did you learn by reading this? Cristofari, R., Liu, X., Bonadonna, F., Cherel, Y., Pistorius, P., Le Maho, Y., … &amp; Trucchi, E. (2018). Climate-driven range shifts of the king penguin in a fragmented ecosystem. Nature Climate Change, 8(3), 245.